Transportation: 12 and 24 volt bus, train and car power supplies can all be converted to POE power. Solar and Battery Power: CAMSWITCH Mobile is ideal for solar powered wireless systems and temporary installations. OEM / Custom: The versatile CAMSWITCH platform can be customised to your needs. Enquire with Veracity for more details. Legacy: Re-use legacy low voltage power supplies. Contact Veracity for 24VAC applications. 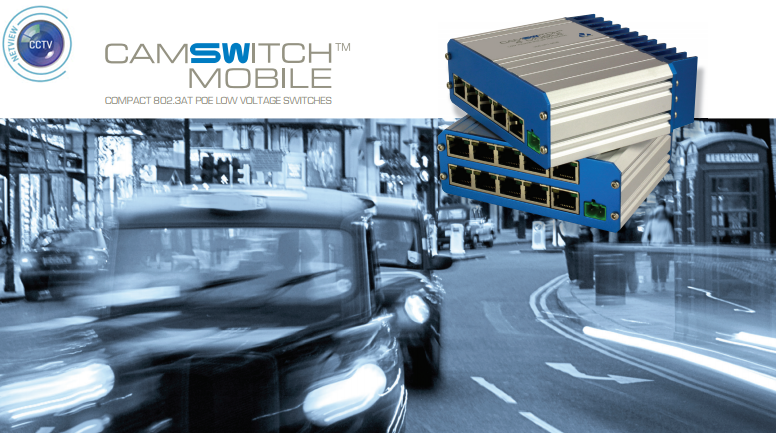 CAMSWITCH Mobile off ers the ideal network solution for transport, battery, solar and low-voltage applications. CAMSWITCH Mobile delivers a network connection and optional POE to 4 or 8 cameras. POE is converted to IEEE 802.3af / 802.3at levels from a 12V or 24V DC supply. All ports support 10/100 Base-T with auto-negotiation and auto-crossover. All ports support 10/100 Base-T Ethernet with auto-negotiation and auto-crossover. POE is automatically detected and enabled to compliant devices. 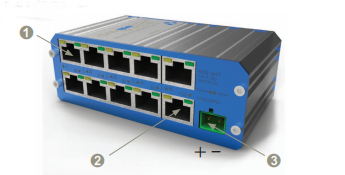 POE is delivered on the Ethernet data pairs for compatability with 4-pin external connectors (e.g. M12). Cables should be secured appropriately to prevent vibration. The enclosed mounting clips can be clipped where required along the side of the unit to permit surface mounting. 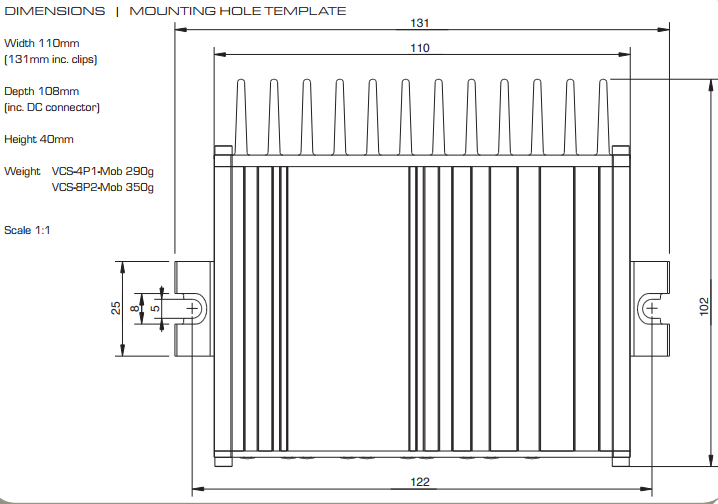 Up to M5 screws can be used at 122mm separation. See the drawing drill template overleaf. Consult the power chart if ventilation is restricted. CAMSWITCH Mobile can deliver up to 80 watts of total camera power at its rated ambient temperature of 50°C. To calculate the power budget required, add up the power draw in watts of all POE devices, as given in their datasheets. (Power classes are not used, and cable losses are already accounted for.) Note that the enclosure may become hot in operation. Restricted access to the product is recommended. The graph opposite shows the approximate temperature rise with moderate ventilation. Note that restricted ventilation and space can lead to signifi cantly increased ambient temperature. 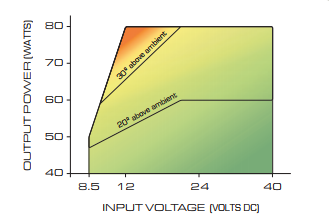 If the input voltage drops below 12V (for example during engine cranking) the power budget should be reduced as shown on the graph, down to 50 watts at the minimum 8.5V DC input. 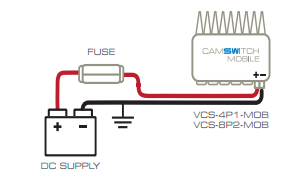 CAMSWITCH Mobile can operate from an 8.5V to 40V DC supply, and steps this up to a steady POE voltage internally. (For AC applications, contact Veracity). Note that the POE voltage is not isolated from the DC supply. CAMSWITCH Mobile is intended for use with IEEE-compliant (individually isolated) POE and Ethernet devices within a closed system.